This Saturday I went on a pretty epic cheat day. Pastry, chocolates, fruit, indian food, beer and who knows what else ended up in my belly in less than 12 hours. I weighed myself the next morning at the same time as always and my scale didn’t recognize me! I had another look at the number on the scale and realized I had just gained 8.1lbs! No wonder the scale was confused. I tried a few more times just to be sure just to see the same result. Needless to say, I behaved very well on Sunday. Went for a run, went to the gym and stuck to the diet. 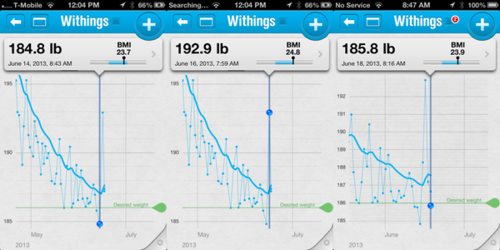 The next morning I was back to 2.6lbs gain and the day after to pretty much the same place I started. So, I managed to gain and then lose 8lbs, all in the span of three days!